Do you raise your own meat or are you just tired of the grocery store quality? If so, Johnson’s Sausage Shoppe has a simple solution for you: we will custom cut, process, and wrap your beef, pork, lamb, or goat to your liking. 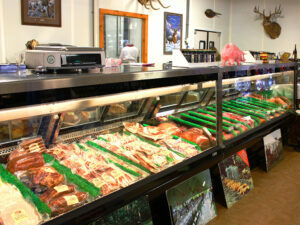 Johnson’s Sausage Shoppe is a state of the art, state inspected processing facility. Every order comes in plastic cry-o vac packaging. We also cater to wholesale clients where we provide personalized labels and portions for retail or market sale. Our on-premise smokehouse enables us to cure and smoke hams, bacon, and sausages. We also offer a wide variety of speciality products such as hot dogs, ring bologna, and beef jerky.